The UN human rights chief has warned of the threat posed by growing global inequality over income, wealth and access to resources and justice. "In recent months we have seen people across the world take to the streets to protest," said Michelle Bachelet. Addressing the UN Human Rights Council, Ms Bachelet referred specifically to a recent wave of protests in Sudan, as well as protests in Haiti and France. She also warned of the "existential threat" of hate speech and xenophobia. 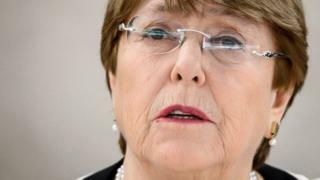 Ms Bachelet expressed concern that the demands of citizens protesting against inequality were being met by "violent and excessive use of force, arbitrary detentions, torture and even alleged summary or extrajudicial killings". "In Sudan, for the past several months, people protesting harsh economic conditions and bad governance have been violently dispersed by security forces, sometimes using live ammunition," she said. Ms Bachelet singled out Venezuela as an example of how "violations of civil and political rights" can accentuate inequality and worsening economic conditions. She also criticised Israel over its blockade of Gaza, and said she regretted Israel's "immediate dismissal" of a report by a UN Human Rights Council commission of inquiry, "without addressing any of the very serious issues raised". UN experts said last week that Israeli security forces might have committed war crimes and crimes against humanity while responding to weekly mass Palestinian protests along the Gaza-Israel border last year. The experts investigated the deaths of 189 Palestinians and said they found reasonable grounds to believe that Israeli snipers had shot at children, medics and journalists, even though they had been clearly recognisable as such. "All parties concerned should exercise restraint as the date of March 30 approaches," Ms Bachelet said, referring to the first anniversary of the start of the Palestinian protest campaign. The Israeli government said the report was "hostile, mendacious and biased against Israel". It has said its security forces have only opened fire in self-defence or on people trying to infiltrate its territory under the cover of the protests.